Product Condition: The Margarita Shoe - Men's is in Excellent condition. This item was previously owned for 3 weeks. The following observations were made concerning this item. * tried on,otherwise looks good. 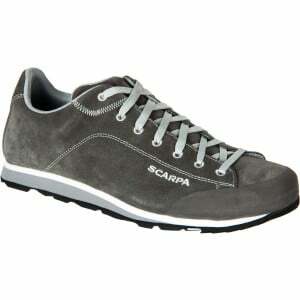 Give your feet a break on your off-days from climbing with the Scarpa Men's Margarita Shoe. The upper's high-grade suede offers style and durability, and the polyester lining dries quickly to keep your foot comfy in warmer weather. This shoe's microporous EVA midsole cradles your foot for extra comfort, and the Vibram Globe Grip sole ensures all the traction you need to cover slippery sidewalks.